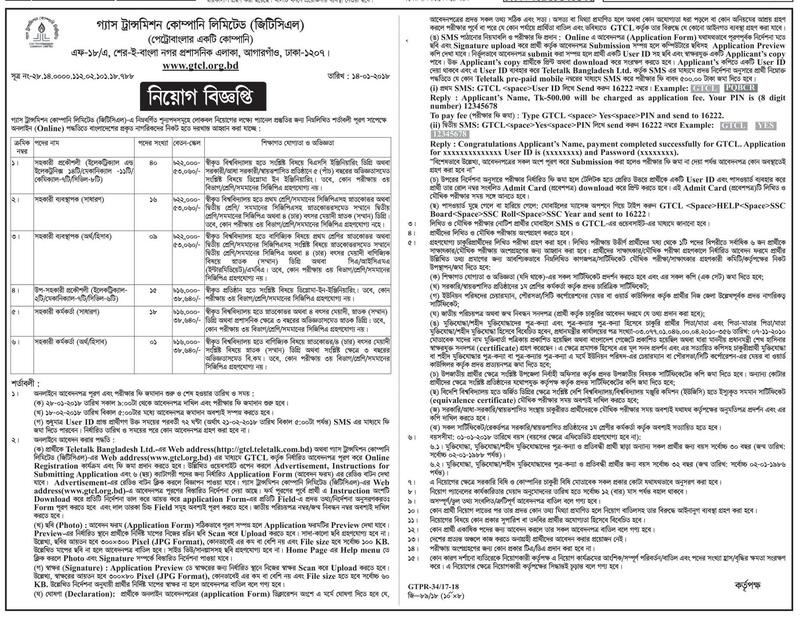 Gas Transmission Company Limited (GTCL) job circular 2018 on various posts. BGTCL published a recruitment notice on the post of Assistant Engineer, Assistant Manager (general), Assistant manager (finance/accounts), Sub Assistant Engineer and Assistant Officer (finance/accounts). Bangladesh Gas Transmission Company Ltd is one of the company of Petrobangla working for gas transportation system in Bangladesh. Job description and other information about GTCL recruitment notice 2018. Read carefully before application. Remember, application system will start from 28 January 2018. Before that date application website may show error. So save or share this post to apply online when start. Application system is online through gtcl.teletalk.com.bd and payment method is SMS using Teletalk mobile. We always try to provide you all kind of job circular and other job related information through our website. So please share this recruitment notice with your friend and join our Facebook page to stay connected.